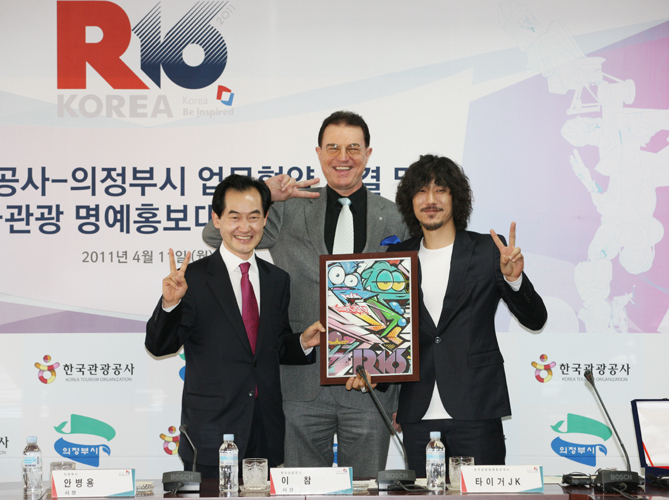 R-16 Korea, the leading B-Boy competition in the world, recently awarded Tiger JK with the title of international ambassador for the 2011 festival. The Korea Tourism Organization, which started the festival with Cartel Creative Inc. in 2007, had a goal of increasing recognition of not only Korea’s flourishing b-boy culture, but to also draw interest to Korea from foreign markets. It quickly caught the attention of the hip-hop community worldwide, bringing in crews from Brazil, Spain, The Netherlands, and the USA. The KTO stated that with JK’s status in the hip-hop world, he was the ideal choice to represent the competition. The festival official began on April 1st and will run until July 2nd and 3rd, where the final qualifying teams will compete for the title of best B-Boy team in the world. The event will be held in Olympic Hall, at Seoul’s Olympic Park.